One assumption in the SFA, HFA and ORS analyses will be addressed directly, however: the idea that the current normal cost is an adequate reflection of the cost of prefunding employees’ benefits as they are earned each year. 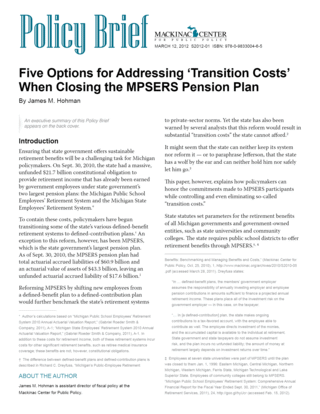 Currently, the normal cost — and particularly the employer’s normal cost — for the MPSERS defined-benefit plan is artificially lowered by the state’s optimistic assumption that nearly all of the plan’s assets will achieve an 8 percent annual rate of return. [*] But from the end of fiscal 1997 to the end of fiscal 2011 — a 14-year period that includes the substantial market returns of the late 1990s — MPSERS’ defined-benefit portfolio realized an approximately 5.4 percent annual rate of return. This performance raises doubts about the reliability of the 8 percent assumption. Assuming an 8 percent rate of return, however, has reduced the plan’s apparent normal cost (and, of course, led to additional unfunded liabilities). It also means the SFA, HFA and ORS analyses, which implicitly relied on this assumption, have almost certainly overstated the difference between the normal cost of the MPSERS defined-benefit plan and the annual employer deposits to the MSERS defined-contribution plan. But even taking the SFA, HFA and ORS comparisons at face value, the transition costs due to the “lower” normal cost of the MPSERS defined-benefit plan can be addressed without increasing the employer’s annual obligations. There are no requirements to duplicate the MSERS defined-contribution provisions in every regard. [†] An employer can choose the cost of benefits in a defined-contribution system. Note that the figures above involve average contributions from employers and employees for a single year (fiscal 2010). Individual employees contribute varying percentages based on when they were hired and their annual salaries. The overall normal cost contribution also varies from year to year based on new actuarial assessments of the plan; for example, the figure was 9.55 percent in fiscal 2009. In a defined-contribution plan, however, the Legislature can choose a particular employer contribution rate, and legislators should recognize that the plan described here is in fact similar in size to the MSERS defined-contribution plan. The money currently set aside for the MPSERS defined-benefit plan is the sum of a 5.38 percent employee contribution and a 3.84 percent employer contribution — a total of 9.22 percent of payroll. The MSERS defined-contribution plan, on the other hand, is a 6.55 percent employer contribution and a 2.55 percent employee contribution — a total estimated 9.10 percent of payroll. [§] In other words, these two plans would set aside similar payroll percentages to pay for retirement benefits. The remaining question, then, is to address the change in unfunded liability payment assumptions that accompanies the closing of a defined-benefit pension plan. [*] Statutory reforms in 2010 required that assets set aside for MPSERS Pension Plus members — i.e., MPSERS members hired on or after July 1, 2010 — be discounted at 7.0 percent, rather than the traditional 8.0 percent. Public Act 75 of 2010, Sec. 41(11), http://www.legislature.mi.gov/documents/2009-2010/publicact/ pdf/2010-PA-0075.pdf (accessed March 12, 2012). [†] As mentioned earlier, the MSERS plan contained a 4 percent automatic deposit and a 3 percent matching payment. [‡] This figure of 71 cents is simply the ratio of 3.84 percent to 5.38 percent — approximately 0.714. [§] Author’s calculations based on Kathryn Summers-Coty, “Examining a Change from Defined Benefit to Defined Contribution for the Michigan Public School Employees’ Retirement System,” (Michigan Senate Fiscal Agency, 2009), 3, http://goo.gl/jnzaB (accessed March 12, 2012). Total contributions in the MSERS plan could reach 10 percent of payroll if employees contribute the maximum amount matched by the state.